Born on a small farm near the town of Speed in Edgecombe County, Joe W. Dickens, Jr., was the sixth of eleven children. After graduating from Conetoe High School and NC A & T University, Joe became an Agriculture Teacher. He served Edgecombe County Citizens as an Extension Agent for 30 years, from 1979 to 2009. 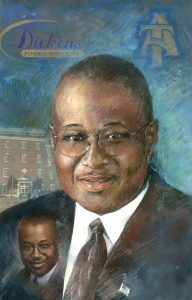 Mr. Dickens served on the Edgecombe County Board of Education from 1982 to 1990, including service as Vice Chairman and Chairman. He was a business owner and a beloved community leader.